I had to weed out a few ridiculous responses that I suppose were intended to ruffle my feathers (they did not). After that, the results are pretty neat! The survey definitely had some flaws (like not being able to check nothing on the “I’d like to see less” question until I edited it late in the game), but the results still give me a good idea of some direction. I’m actually kind of glad to see Nothing + Other (which was most often a write-in for nothing) at the top. Whew! I was not surprised to see product reviews as the most checked box – I stopped doing formal product reviews over a year ago, and I’m glad I made that decision. I was a little surprised to see house organization as the #2 since I feel like I get a lot of requests for that, but that’s some good feedback! In general the LESS mirrors the MORE so that’s good too. Exercise: how much do we really need? I will admit, it will probably take me years to cover all of those. And some of them I’m not sure I want to write on (for example, I feel there are so many great vegan/gluten-free blogs out there that I’m not sure writing about these topics would really be all that helpful). The diet trends request is another tough one. I feel that to really write about some of these trends I would need to do some deep research to support a post instead of just giving my opinion. I’m not sure at this point in my life I have time to do this kind of research-based blogging, but perhaps when Mazen is older and I have chunks of time back? But unfortunately I don’t think this will be a near-future topic. Unless I can think of a way to just scratch the surface and still write a meaningful post based on research (like Amelia does in this post). Thanks, as always, for your feedback! I definitely want to do more surveys in the future. Thanks for posting the results for all of us to see! 🙂 I can’t believe, wait, yes I can, that some people would take the time to be so negative. These people need more hugs in their life! Brilliant idea about the nut butters review–I’ll look forward to that post especially! Cool to see the results! What program did you use to set up the poll? I’m another who loves the home organization/nerd posts. I’ve got some great ideas from you. Great feedback! You really do a good job. Me too! I am a naturally messy person who holds on to things that I should get rid of and it’s so nice to see how really organized people keep things in their home. It’s definitely helpful for me. Bring on the Home Neat Home! Ditto. Very inspiring posts I thought. yep. I can’t get enough of organizing, decorating, & reno posts. 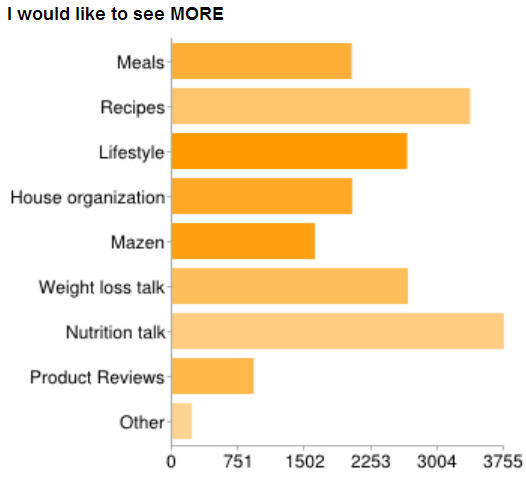 That’s one of the things that distinguishes your blog from other food/healthy lifestyle blogs. I agree! I would love MORE home organization posts, not less. Yikes, I’m having non-voter regrets! Your home org posts are among my favorite, Kath! In fact, I LOVE them. Please don’t quit Home Neat Home! I agree. The tidiness and airiness of Kath’s home has been inspiration for me. I’ve tried to better myself in the organization/cleaning department thanks to Kath’s posts. I cant wait for the top nut butters, yum! Thank you for sharing the results! It’s really interessting to see what other readers think ad want. Hope you have a wonderfull day! Why are you surprised by the fact that people want more weight loss and formal nutrition posts? She is a registered dietician, of course! It would be great to see her putting her years of hard work to share with her readers. It was interesting to see the results of your poll! I’ve been reading for years (and I’m one of the people who enjoy the home organization posts, haha! ), and I look forward to the evolution of your blog going forward. Cheers! I’m so glad you shared the results, I was curious! Although my blog is much, much smaller, I’m considering doing a survey like this tomorrow! Thanks for sharing these results, I’m curious to see where your blog goes in the future and how you will incorporate some changes. Looking forward to reading the posts you are working on now – they definitely interest me for sure! All the best to you and your family! Were there any comments that were not ridiculous but that actually had valid suggestions underneath the negativity? I didn’t take the survey *blush* but I think it would be neat to see a post on how you deal with negativity in the blog world (ie- comments intended to ruffle feathers). Also, I would like to see guest posts from your Mom and Karen! The home organization is my favorite piece of your blog…I would LOVE to see more Home Neat Home posts! Fun results and great summary. I, for one, favor your out-of-the box posts like this one. They remind us of your all-around creativity and offer you more of an intellectual challenge. I think the example you cite of Amelia’s post comparing various diet programs is exactly the type of post I envision you doing and doing really well. Plus, it would really engage readers eager to express what diverse opinions. Gena (Choosing Raw) posted another great example today on a fascinating subject that would fit into theme of “health in the news.” Neither of these would require intensive research but rather a review of a several online articles. Your outstanding sunscreen lotion safety summary that you posted this summer is another example that springs to mind. Thanks for eliciting and listening to our feedback, Kath. Thanks for sharing! I think it’s so interesting to see what other readers are requesting too! It sounds like a really helpful tool to point you in the right direction! I’m excited to see a post on nut butters! I know some of them have different nutritional stats – do you think you could touch on that? Like cashew nut butter seems to only have 160 calories per 2 tbsp serving and I’ve heard that’s it’s better than peanut butter for you – but I don’t know if any of this is actually true! Anyways, would love your input. Also, I recently tried peanut butter with flaxseeds in it – it’s got the perfect amount of crunch! Seconding Juli’s request. I would be interested to see discussion of nutrition as part of the top nut butters post. I pick them up at the store and put them back down when I see all that sugar! So it would be great to have recs on the healthy NB choices. Can’t wait for your top nut butters….though it will probably make me want to visit the US to come home with a case full of them! So excited I have just recently stumbled across your blog and fell in love with reading it. I love how unpredictable your posts are. My favorite topic coming up in the near future is definitely the one on the nut butters! My sister and I have recently become obsessed and are so jealous of all the wonderful homemade ones you have on your blog posts. We can’t wait to hear your favorites so we can hunt them down at the nearest store they can be found. Your breakfasts always look SO delicious. Thanks for the inspiration! Fascinating! It’s fun to see the results. I’m actually really surprised by some of them. Marriage and romance? That made me chuckle . Not to insinuate you don’t know anything about that, it’s just not ever been something you blog about, it sort if seems like you purposefully don’t, which I think is fine since you have a healthy eating blog. Do you think you will transition more into lifestyle blogging and include those types of things? Thanks for sharing the results!! I enjoyed having the opportunity to fill it out but also really intrigued by everyone else’s answers! Ack! Please do not do fewer house organizational posts. That is one of the top things that I really love to read about on your blog as it helps me get my own life in order. I’m serious! P.S. I’m glad you aren’t letting the trolls get to ya! I use blogs like this for recipes. Love all the food I can make! This was so cool to see! Thanks for posting the results! Thank you for taking the time to do this Kath! I am glad that you do not take negative comments to heart. I absolutely love your blog and would hate for you to get down about it over a few negative comments! You rock!! I’m excited for the top nut butters post! I’m curious if you read all your comments!? I think the fact that variety came up as the biggest LIKE factor means that you just continuing to switch it up on various topics as you always have done is basically what everybody enjoys! 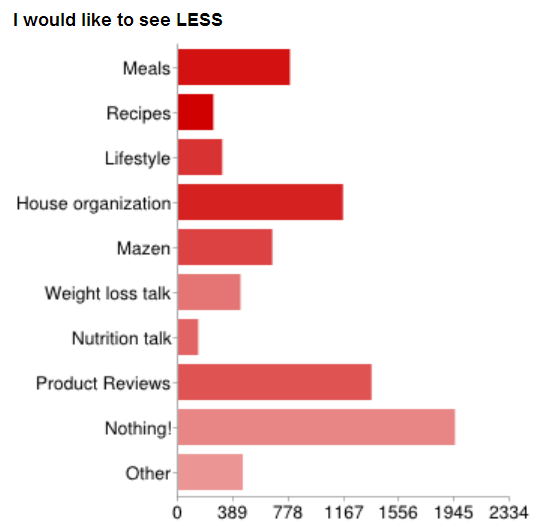 I like the variety of your home organisation, lifestyle, food, nutrition, family life and Mazen. I think you have a wise voice on various subjects and would like to hear your views on any things related to life or musings! I like the fact that you talk nutrition, nourishing, as opposed to dieting and depriving. Your blog is a refreshing place! I can see no food politics / discriminations on your blog but a healthy attitude and buying local/fresh/real/organic! all good! So excited to be seeing more recipes from you in the future! I just want to say I think it’s so cool that you’ve made it a point to be so in tune with what your readers would like to see. Many people are so closed to feedback. It’s very refreshing to see your openness! I’m exicited for all the topics. I did participate in your survey, but I forgot to say that I’m always interested in food prep post. Which food can be prepared, etc. I come home at lunch time and then I’m always to hungry to cook, so lunch has to be prepared before. (Lunch is like your dinner here in Germany. We eat the sandwich and the salad for dinner and a warm meal around noon.) Thanks! Yep! I’ve mentioned a few whole foods (Alaska fish,apples) but I haven’t done reviews. Isn’t it amazing to see how far you’ve come? You started just as an online food diary and now you have THOUSANDS of people telling you what they like and don’t like about your blog!!! That is absolutely mind blowing Kath! Aww, I’m one of the 3% who wanted more baby 🙂 I’m a faithful BERF subscriber, though! Thanks for sharing the results–I’ve been an on-again,off-again reader for years now and always find your blog inspiring! People are so interesting. I love to read your blog and look forward to your posts but rarely take time to comment, so it shocks me that someone who mean spirited would take the time to attempt to ruffle your feathers. Good for you for being the bigger person and not letting it get to you! I look forward to your future posts, whatever they may be! Are you still taking suggestions? I would love for you to do a post on body pump as you mentioned a few times that you take that! I am just curious as to what kind of clothing and shoes to wear for it, and what kind of results to expect! Please considar! I just want to say thank you for actually caring about what your readers want to read…I know it sounds silly, and I know that blogs are a free commodity that we don’t have to read, but seriously the product pushing on some other top blogs is getting to me so much! Sometimes it just feels like we’re being brainwashed when 12 blogs post on the SAME DAY the same review of a certain product. I commend you realizing that we, as readers, see what the companies are trying to do. I just really appreciate it. I’m looking forward to your blog having a variety of posts!! You should be writing about whatever you feel like focusing on. Love that you may talk about gardening, home, throwing parties etc! I could not agree more with this comment! I agree! It’s sort of annoying to see the same products on all of the blogs. Like a few weeks ago when pretty much every blogger in my reader was shilling the Old Navy workout clothes. It just seems kind of fake. It’s nice to not see that here. In your nut butter post could you touch on making your own nut butters. It’s such a huge money saver but when I’ve tried it the results aren’t anywhere near the store bought stuff. Would love to hear if you’ve tried this and if you have suggestions! Kath- you really are the best. I can’t tell you enough how much I love your blog. I’m recovering from disordered eating and constantly trying to learn more about nutrition and what my body needs- and your blog provides for me a positive safe haven for advice and wisdom. I’m really really really looking forward to the posts that you are working on- keep rocking. This was so interesting to see. I’m looking forward to the variety of posts you will be doing. This makes me think I should do some kind of survey on my blog. Periodically I ask my readers for post suggestions and I get such a variety of ideas from them. I love how easy it was for you to analyze your data! AND what a great response! Thanks for being so open to listening to your readers and I’m sorry about those meanies who wrote things to “ruffle your feathers” because boo them! I’m excited for the nut butters post! I’ve really fallen in love with almond butter, I also like sunbutter and PB and recently tried Teddie brand white choc! I’d also like to hear more about why they are good for us! lovely to see the survey results. have been a long time reader and its nice to see the transition from food diary to more thoughtful posts. Pleeeeeease don’t reduce the Home Organization posts! You really inspire me in this department!! Thanks for sharing. It’s exciting to start a new stage in life. I love your optimism and honesty. I love the organization posts! Please do more of those! Hi Kath, that list looks good. It was good to see results. What is NerdKerf? It was great to see the results! I’m glad to see most people have the same opinions as I do. I’m very excited to see what posts we get in the future! I would really love to read about how you incorporate meat (beef, pork, chicken, eggs, etc.) in your diet. I’ve been reading a lot about vegetarian diets and just don’t think going 100% is for me, I do want to eat less meat. It seems like you strike a good balance with your meals, but haven’t found anything discussing your thought process behind it. Some specific questions: Do you purposefully stick to a certain number of meat-based meals each week? Or do you eat it whenever you want it, but keep portions small? And when you buy meat, do you go for specialty (grass-fed, organic, etc.) or conventional? One more. 🙂 Your thoughts from a RD standpoint regarding the health (or maybe not) of eating meat. There’s just so much conflicting info floating around, so I’d love to hear your take on it! I SO appreciate that you don’t want to write posts ‘reviewing’ current diets or diet trends because you don’t think you’ll be able to do enough research to be able to really offer a good opinion. I’ve gotten frustrated because I’ve seen a lot of posts by other bloggers that are fairly shallow and misrepresent the facts about health and diets because it does take a lot of time to understand and write about the science. Thanks!